Terminator Genisys laid down a whopper of a plot point in its last trailer. In fact, it’s so big that many people consider it a huge spoiler. If you’re one of those people, then you’re going to hate what we’re about to show you. 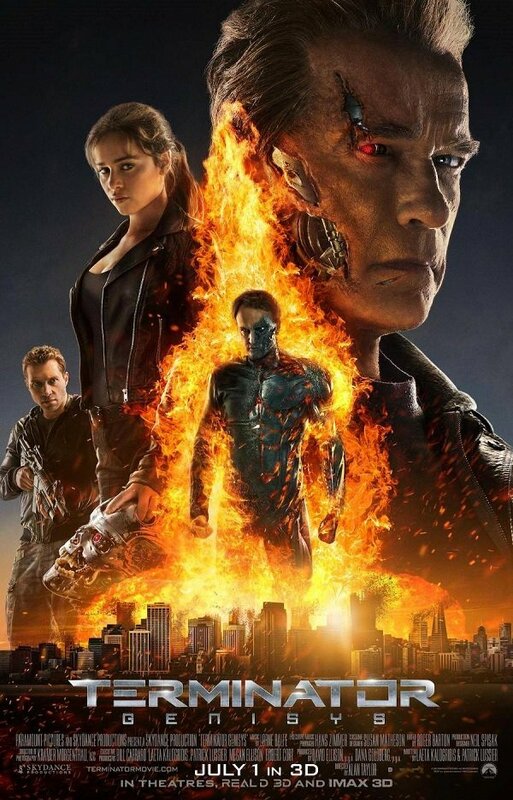 Everyone else, you just might dig this new poster for Terminator Genisys. Yahoo shared the newest look at the machine promoting the machines of Terminator Genisys, and it actually looks pretty awesome. The look is definitely more in line with the retro "faces and explosions on the poster" marketing model that most films either replicate or try to avoid these days, but in the case of the latest Terminator film, the more retro vibes it emits, the more convinced we’ll be that it can handle a trip back to the franchise's beginnings. But just as we were getting used to the retro "feel trip" this poster gave us, the elephant in the room sat down and ordered a cocktail. We’ve put it off long enough, but we now have to talk about that big honkin’ spoiler. Front and center, in the midst of Emilia Clarke looking like a badass, Jai Courtney looking like he might make up for his participation in The Divergent Series, and Arnold Schwarzenegger looking like we just might get another solid Terminator flick out of him, we get… the twist. Jason Clarke’s John Connor is revealed once again as a robot, only it’s not in a trailer you can conveniently avoid… it’s right bloody there for anyone in the theater lobby to see. On one hand, this could be made into a huge case of overplaying your hand before the cards are all on the table. The marketing department can always backpedal from a trailer showing John get blown apart and reconstructing himself with nanobots, but a poster? That’s in front of anyone who walks by, whether they like it or not. Until they institute spoiler shields in theatrical light boxes, where you press a button to see that spoiler right there and then, this is definitely going to ruffle some feathers. Of course, another way of looking at it is the fact that maybe, just maybe, there’s a bigger twist. Considering the marketing team behind Terminator Genisys understands just how big of a deal this spoiler would be, you’d think they’d save it for the film’s deployment. Which begs that we ask the question, is this really the biggest spoiler the film has to offer? Keep in mind, there’s still another, even bigger rumor out there about who pops up in the events of director Alan Taylor’s Terminator debut. The point still remains that, with this knowledge willfully released by the marketing folks, this film want us to know John Connor is a machine/human hybrid of some sort. What purpose, other than getting asses in seats, does this reveal serve? We’ll be able to better answer this, and a multitude of other questions, when we get to finally feast our eyes upon Terminator Genisys, as it takes it first bow on July 1st.